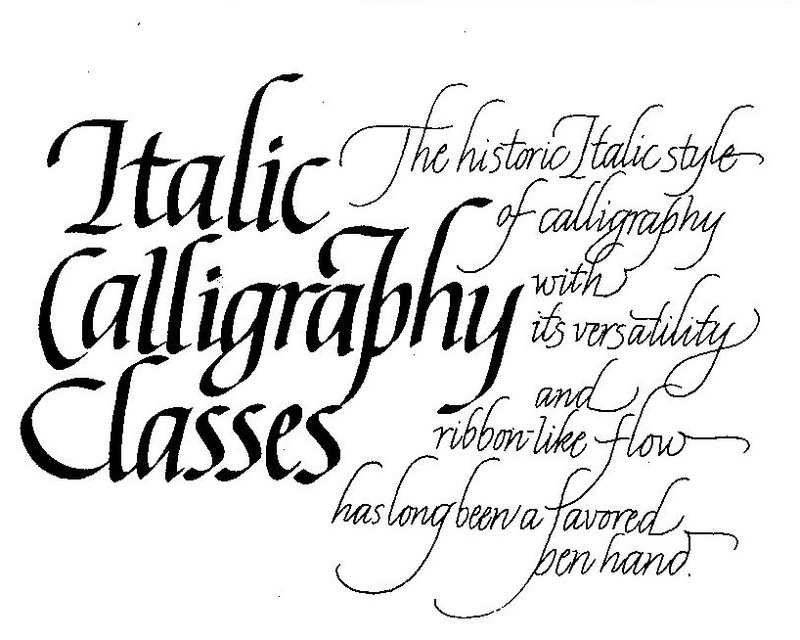 CLASSIC PENMANSHIP AND VARIOUS BROAD NIB STYLES are taught by Karen McMannon in a simple yet thorough approach. Students will experience its practical application such as envelope addressing, place cards, certificates, and camera ready art. Finer applications shall be explored through monogram and layout design as well as flourish and color play. Periodically Karen offers classes by popular demand. If you are interested please contact her via email. TIME: A FULL CLASS IS SIX STUDENTS. FEE: $25.00 per class plus a registration fee to secure placement. This amount goes toward the purchase of initial tools, inks, worksheets, handouts and experimental materials. NO NEED TO BRING ANYTHING TO FIRST CLASS. PLACE: THE CALLIGRAPHY STUDIO OF KAREN McMANNON, 9467 Montgomery Road, Montgomery Heritage District, in a landmark building, located between Montgomery Cyclery & the old Universalist Church (noted for its orange brick pillars), at the corner of Remington Road. Ample parking in rear of building. Enter side door next to Church. If you would be interested in a future class, feel free to contact me. © 2006 - 2017 Karen McMannon Calligraphy, The Write Way, All Rights Reserved. Site designed by Leslie Hiller | Developed by Adrian D. Alvarez.